Chungwoo E & E Ind. Co., Ltd.
DONG YANG CAST IRON CO., LTD.
HANKUK GAS INDUSTRIAL CO., LTD.
Shin Han Precision Co., Ltd.
Busan City Gas Co., Ltd.
Bosung Engineering & Manufacturing Co., Ltd.
Cheon Bok Machinery Co., Ltd.
South Korea is a major energy importer, importing nearly all of its oil needs and being the second-largest importer of liquefied natural gas in the world. Electricity generation in the country comes from conventional thermal power, which accounts for more than two thirds of production, and from nuclear power. In addition, Korea companies have started to include renewable energy machine such as wind turbines in their portfolios, so they can compete both domestically and in the international marketplace. Similarly, the wind turbine ancillary market is also flourishing, with companies supplying or planning to supply towers, blades, main shafts, generators, transformers, gearboxes, nacelle control systems and cables. And, the small wind turbine manufacturing sector is also very active, with South Korean firms looking to provide equipment to small and island grid systems. 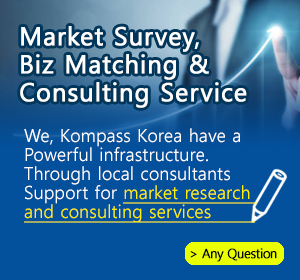 With over 500 South Korean companies registered in the Kompass B2B worldwide database, the Energy, Environment sector represents small activity sectors within our database. This family includes Energy, Environment industry including electricity, water, natural gas, crude oil, waste management, etc.